Between Britian's SkyNet satellite and the continued advance in intelligent machinery, it's no surprise that the end of the world at the hand of machines genre has been so successful in theaters. After watching the Terminator trilogy and the Matrix trilogy, it's difficult to see the rise of advanced technology without becoming a little paranoid. Cornell's self-modeling robot doesn't help much. Unlike most machines, the robot is not programmed with a specific way to move. Instead, it is instructed to move in a random way, and from those random movements, determine which movements help it get to its destination. In different environments, the robot uses different methods to move, and can even adapt to damage done to any of its legs. We demonstrate, both computationally and experimentally, how a legged robot automatically synthesizes a predictive model of its own topology (where and how its body parts are connected) through limited yet self-directed interaction with its environment, and then uses this model to synthesize successful new locomotive behavior before and after damage. 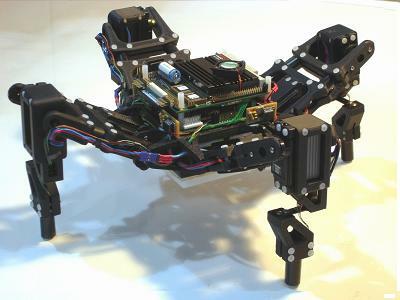 The legged robot learned how to move forward based on only 16 brief self-directed interactions with its environment. There are videos on that site that show the robot moving. It's impressive, but not terribly threatening. Not yet, anyway. But this is certainly a great basis for a hunting robot. Human-hunting robot, that is. I was curious - how do you put the reading bar with the picture on the side of your blog? I want one! The way I'm doing it is kind of technical; I've got a reading list in a database, and when I sign-off on a book, the next one automatically shows up.